With over 38-thousand ratings on Goodreads alone, The Blade Itself needs no introduction. It’s a book that Fantasy readers world wide have read and, in the majority of cases, really enjoyed, and it’s also one of those seminal titles that I’ve been wanting to read since I started this blog in 2008. Finally, I got it done! 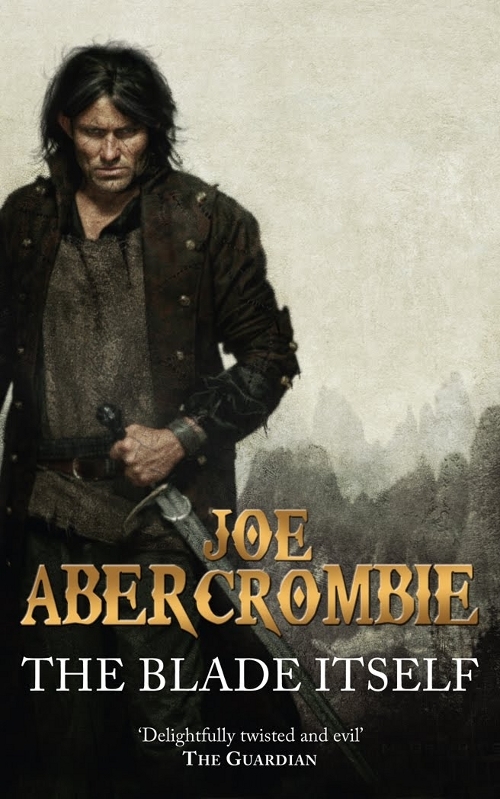 🙂 And damn Joe Abercrombie to the Olympus-mount of Fantasy writers – because it’s a damned good read. As I said, most of you will know this book, and the characters, so this review will just focus on my thoughts of the experience of reading the book and meeting the unforgettable characters that populate it. First, you’ve got Logan Ninefingers – feared, a terror of the North, fighting and then tumbling off a cliff. Definitely not the barbarian that readers probably thought they would encounter. He’s stubborn, intelligent, naive, and a peerless combatant. But he has some crazy-cool secrets, too, and the whole package makes him one of the most interesting characters I’ve had the pleasure of meeting in any form of fiction. Jezal was the character I most enjoyed – he’s an utter chauvinist and whiner, but his about-turns in the novel were excellently handled, showing the reader not only his strange sense of honour but testing his limits and opinions. These were the stars of the book, but the world Joe created for this trilogy (and which he continues to explore in the stand-alones he has since published) is a star all its own – the various cultures are expertly described, neither too much nor too vaguely, and I got a real sense of the landscapes and vistas Joe explored. It doesn’t surprise me at all the Joe has managed to explore the world so successfully – even those aspects of it just hinted at, when compared with what he shows us, were memorable. The action in the book is hard and brutal, gory in most instances but always hard, and I stopped counting how many times I winced when blows fell. But the actions suits the characters, too – Glokta can’t wield a sword, for example; Jezal is more of a fencer, and Logan is strong and brutal with almost anything. Plot-wise, the novel ticks along at a good clip; Joe manages to keep the pace up, even in some of the more political-passages and chapters, and the climax was both satisfying and promising, so I’m eager to Before They Are Hanged and Last Argument of Kings. To order your copies of The Blade Itself, click here for Amazon US, here for Amazon UK, and here if you’re in South Africa. There is also a boxed-set of the trilogy available: US, UK, South Africa. Do go and check out Joe’s website – plenty of info on all his work to date, an entertaining blog, and regular updates on the graphic novel-adaptation of The Blade Itself.